The Urban Yoga Architecture undertook its most challenging endeavor to date. We joined a mission to Western Sahara Refugee Camps. Western Sahara is the last colony in Africa. When Spain decolonized its holdings in Africa in the year 1975, Morocco took over almost the entirety of the territory. Half of the territory’s citizens today live under occupation, and the rest live in refugee camps in southwestern Algeria. Families are kept apart by the longest military wall on earth and some 6 million land mines. The Western Sahara civil and political movement Polisario struggles for the right to self-governance and peaceful independence. 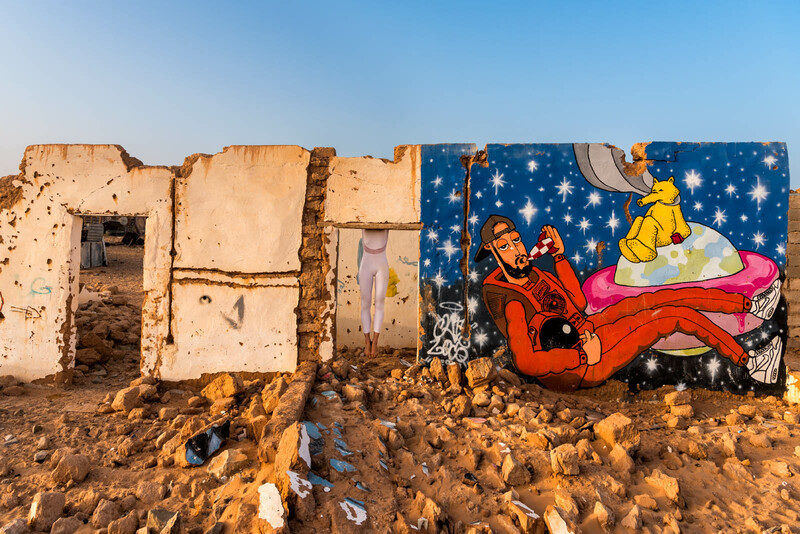 Saharawis recognize art as the medium of their very identity, and as the means to inform the world about their plight. I joined a mission run by Erik Valenčič, the internationally renowned investigative journalist, who is shooting a documentary about the Saharawi nation. Arne Hodalič and Katja Bidovec, photographers for National Geographic Slovenia, were also members of the project team. Together with Arne and Katja we composed a The Urban Yoga Architecture photo series entitled Landscape Is Human: Western Sahara Refugee Camps. I cooperated with the Saharawi artist Mohamed Sulaiman Labat, as well as with Mohamedsalem Werad, founder and author of the blog Saharawi Voice. Polisario had invited me to enter the refugee camps, which was the only possible way to do so. Landscape Is Human: Western Sahara Refugee Camps headed on this trip to expand the depth and scope of The Urban Yoga Architecture project through the eyes of forensic architecture. This new branch of architecture explores social conflicts and burning environmental questions. In Sanskrit the word “yoga” comes from a root meaning “unity” and “awareness”, and placing the human body and the concept of humanity in the forefront of architecture is accordingly a logical extension. Landscape Is Human is thus laying the foundations for a new, human form of expressing architectural realities. I financed this project with the help of my community. Therefore, I would, however, be grateful to all of you who share my interest to support this project. Donations can be made to my account: SI56 0201 0276 2770 359, Anja Humljan, independent cultural worker, Trnovska ulica 4, 1000 Ljubljana, Slovenia (Code: “Donation”). The Urban Yoga Architecture and myself will be additionally empowered by your contributions and especially your attentiveness on this important mission. We made a lot of amazing photos, so it was really difficult to narrow them down to the final selection of nine. They will be released this fall and we could not be more excited!